A neck adjustment or cervical adjustment is provided by the doctors when an area in the upper or lower cervical spine has been found to be “fixated” by motion palpation. Motion palpation entails taking each of the joints in the neck into different planes of motion to distinguish a freely moving joint from a “fixated” joint. 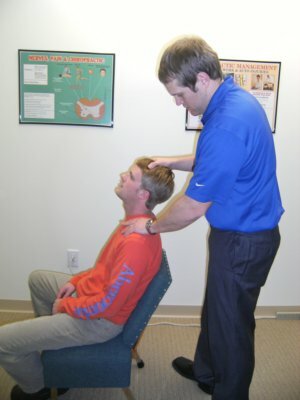 Some joints in the neck can also be moving too much, this is what we call a hyper-mobile joint. In most cases it is the hyper-mobile joint that is the culprit. This hyper-mobile joint causes other joints to become fixated to compensate. A hyper-mobile joint is highly unstable which starts laying down more bone. This is how we get osteophytes (bone spurs) and disc herniations in the cervical spine. It is our goal to find the areas that are hypo-mobile or “fixated” and adjust this area restoring proper motion to all joints in the cervical spine. At ZCRC we do not do any extreme rotating of the neck and cervical spine that makes a lot of people uncomfortable. Most cervical adjustments are provided in a chair with little rotation making the adjustment easier on the patient and the doctor providing the adjustment. Occasionally though, a patient may need a cervical adjustment laying face up or face down on the chiropractic table. As you can see very little rotation is used when providing this adjustment. The coupled motion of the cervical spine allows for this action to happen.